MMRC, as of today, has completed about 9-km of tunnelling and has generated and disposed of 19,40,254 cubic meters of muck. Metro-3 corridor at Chhatrapati Shivaji Maharaj International Airport Terminal-2 station. Wainganga 1, the Tunnel Boring Machine, which was commissioned on 8 January 2018 from Pali ground Marol completed its tunnel drive of 1.26-km in package 7 to see the light at its end at CSMIA T2 station. It marks the achievement of an important milestone towards the coherent completion of the 33.5-km long Metro-3 corridor. It is the result of blood and sweat expended by a team of nearly 250 engineers, technical and mechanical workers together. ” The state government has embarked upon its journey to complete 270 km long comprehensive Metro network over next 3 to 4 years and Metro 3 is an important part of the same. I am extremely pleased to witness the first TBM breakthrough achieved by Metro 3 team today. 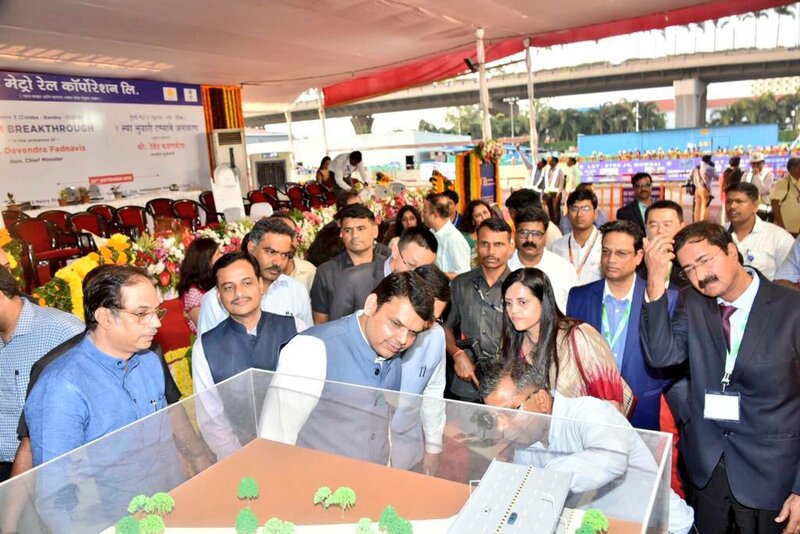 It is no doubt an important step towards a safer, more comfortable and faster mode of transport to be made available to Mumbai citizens, ” said the visibly happy Chief Minister Mr.Devendra Fadnavis. Wainganga 1, made its way through the rocky strata made of Basalt, Breccia and Tuff drilling relentlessly for exactly 259 days to attain the breakthrough which will now be remembered for a long time and will certainly be lettered in the history book of the corridor. It has charted its course from under important infrastructure like Metro Line-1 and Sahar Elevated Road. The 92-meter long Wainganga bored, on an average, 4.6 meters daily shaping the tunnel with 901 RCC cement rings. Metro-3 corridor in its 4.157 km long package 7 spread between CSMIA T 2 station to the ramp at Aarey colony will provide access to Versova-Andheri-Ghatkopar Metro-1 at Marol Naka and Swami Samarth Nagar-Jogeshwari-Kanjurmarg-Vikhroli Metro-6 corridor at SEEPZ and also to business hubs like MIDC and SEEPZ which today are not connected by suburban rail. Of course, the Mumbai Metro Rail Corporation (MMRC) hasn’t achieved the feat without its share of challenges at various levels, hard work and colourful rancour! “Team MMRC could overcome the challenges only with a strong support from Honourable Chief Minister of Maharashtra Mr.Devendra Fadnavis, his very effective War Room and all other stakeholders”, concluded Ms.Bhide. MMRC, as of today, has completed about 9-km of tunnelling and has generated and disposed of 19,40,254 cubic meters of muck. For the purpose, 17 Tunnel Boring Machines have been lowered in ten TBM shafts and 14 of them have been commissioned. The remaining three will join the squad to drill through the underbelly of the city in the next month.